Welcome to the second lunch in my Spider-Man: Into the Spider-Verse series! My family loves this movie so I had to make my kids a series of lunches based on it. 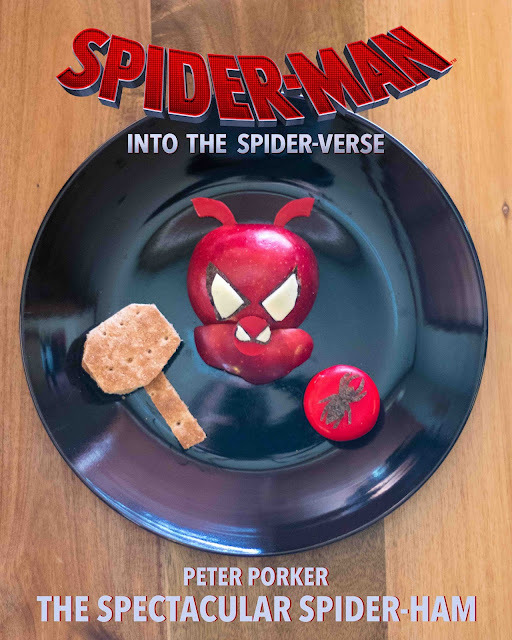 Spider-Ham (Peter Porker) was my youngest's favorite Spider-Man in the movie, so this lunch was for him. As you can see by the photo, the meal is pretty easy to make so I'll just give you the ingredients because you can figure it out from there. Make sure that you check out my other Spider-Verse lunches and definitely watch the movie! Peter Porker: Red apple, red wax from cheese round, nori, slice of white cheese. Hammer: Whole wheat bread slice, sliced turkey. slice of white cheese. Spider: Red wax cheese round, nori.